Sequel to Marrow, the imagination stirring beast of a novel about a planet sized spaceship and the near eternal existence of its inhabitants, starts where the previous novel finishes and then seemingly abandons everything that was interesting and engrossing about the first novel, it's world building and conflicts, in exchange for a long drawn out game of espionage and war against a being the size of a nebula.In general I'm not opposed to espionage fiction, especially if written by Le Carre, I'm not even specifically anti-space wars as I've read some good ones by Haldeman for example, and it's not even like there isn't a giant leap of science fiction imagination in the creation of the villain of this war - he's still thinking BIG; but the scope of the BIG idea is narrow and the passage of time that underpinned the epic quest nature of the previous novel is missing, partly it feels like a real lack of magic in the telling of the story and partly it's just a bit tedious and repetitive, almost to the point where it felt like some padding to a much smaller novel. I was largely unmoved by any of the events, the characters feeling flat and undeveloped, the inevitability of the denouement undercutting any danger you might feel for them. And then it just sort of ended with something of a ghost in the machine get of jail free card for the author.I wonder whether the third book will even be worth looking in to. Brilliant, absolutely brilliant for the first half. Second half a bit less so, and the ending was utterly "out of nowhere" and anticlimactic (i.e. if this was a tv show, it would end with a "to be continued next week"... only it's been a few years since this book came out and no news of when to expect the sequel. )Reed's story takes place on The Great Ship, a giant artifact (big as Jupiter, and hollowed out) that may date from the beginning of the universe, and which humans colonized and turned into a Dubai of the future, minus the imported slave labour. Only thing is, in the prequel to Well of Stars, we learn that this alien artifact was not intended to be a tourist cruise ship, but is in fact a prison, with a small planet hidden suspended at its core, and some malevolent deity - somehow tied into the very creation of the universe, or so it is repeatedly suggested - imprisoned within.The combination of such a mega-vessel (it holds billions upon billions) with practically immortal and indestructible (post-)humans and aliens, gives Reed an interesting canvas on which he paints great heroic stories. It's got all the naive enthusiasm of Starship Troopers, minus the angry machismo - think sedate fascism in its sexiest guise (i swear, when i think of "the captains" i think of an SM cult).People have criticized him for the one-dimensional characters who don't really change even as the centuries tick by (sometimes several in a chapter), and it's fair comment, but aesthetically, in terms of an "enjoyable read", i find it works. Minimalist when it comes to character development, sure, but that's not to say the characters aren't deep - they are, in an archetypical sort of way. They just don't change much (unlike in Marrow).On the other hand, Reed's work is lush with concepts, weird species, and ideas/protagonists who go beyond the historical to the "spiritual". [SPOILERS:]In this book the captains - led by lovers Washen and Pamir of course - face a Nebula-size being that wants to take the Ship to liberate its prisoner, in the hopes of ending this imperfect universe and allowing creation to follow the course it was meant to. Takes a while to figure out they're dealing with one big organism not a bunch of smaller ones, and by the time they do it seems in the process of "digesting" the Ship and hacking it to pieces with a solar-system-scale chainsaw made out of black holes (i kid you not). Turns out the gigantic alien being has its own mythology all backwards, as we learn at the eleventh hour, but it's too late to stop it. Enter a deus ex machina to save the day, unexplained how or why (but we know it's something bad, having to do with the imprisoned being in Marrow) - the saviours take control of the ship in the process, and then... the book ends!Talk about anticlimactic!! !One thing i did notice, despite the incredible fast speeds (up to a quarter C at one point), and the time span of centuries, relativity doesn't seem to play a role in Reed's Marrow universe. Not sure if this is because he posits some kind of non-Einsteinian reality, or if it's an oversight, or somehow compensated for in an unexplained way.Also, gotta say, as a Lost fan i find there's some parallels between the Marrow concept and elements of that tv show. I.e. The deity imprisoned in an unlikely prison, and people who "just happen to" find themselves there, roped into saving or dooming the whole of creation, while wondering increasingly how much has been chance and how much has been orchestrated.i liked this book a lot, but if you're gonna read it i suggest reading the preceding volume, Marrow, first. Better yet, wait til Reed writes the sequel! As I read this book, I realized that the closest comparison I could make was to Doc Smith. There's the same epic sense of scale, both in the events that occur and in the sheer size, distance, and lengths of time involved, and also the same steely resolve of the characters as they manufacture superweapons and battle in some awesome, over-the-top war against completely bizarre invaders. Strangely, the most interesting characters are not the transhuman Captains, those hundred-millenia-old superhumans whose personalities are burnished smooth by endless duty. In this case, I was drawn to the person set up as a polar opposite: O'Layle, the traitor, whose character is an endless ouroboros of recursively self-believing lies and venality. He and the emissary Mere, a person whose crucible existence has left her the barest reduction of a human being, are the most engaging characters to read about and I found myself wanting to skip the intervening chapters to get back to their story.Reed manages to step up from the awesomeness of the Great Ship itself by introducing the Inkwell, an engineered nebula where powerful, unknowable things lurk and build mysteries in the darkness, and who even push the cold dust around to prevent them from condensing into prestellar material. The resolution of their mystery didn't quite satisfy, but I found the weaving of their philosophy to be very unsettling.The story fortunately remains with the Great Ship for the vast amount of it, and I think this strengthens the experience, as opposed to the previous book. We also see more of the intriguing Remoras and amusingly crusty harum-scarums. Have you ever read a book and been so in love with the setting that you wish you could spend more time there and didn't care about characters or plot or anything else? After finishing Marrow, I was somewhat underwhelmed by the actual story, but was quite in love with the planet sized spaceship and its passengers. I considered myself acutely lucky, then, to have run across this book, which I didn't even know existed, while reading its predecessor. I was able to set down the one and begin immediately on this.Some sequels could be read out of order and still make sense, but this one begins exactly where the last one leaves off, and relies almost entirely on events and characters from the first book. The characters finish mopping up the messes from the first volume and begin slowly to realize that they have a new problem even larger than the first, but really there isn't much in the way of plot for the first half of the book. I cannot recall having read a book that was so slow to develop and been so unconcerned about it. It takes easily the first 300 pages before anything starts to happen - characters are introduced, situations are hinted at, but everything happens at a slow, even languorous pace. But as I've mentioned already, I was quite willing to wallow further in this world and didn't really care if they ever had a crisis to solve. And once the book starts moving, it really churns out action befitting the tale of a planet sized spaceship.One warning is that it is left open for a sequel at the end, but although the author has apparently set various short stories in this universe, there is not yet a new novel. Well of stars boasts hands down the single coolest weapon I've ever read about in any work of fiction to date. A chain of superconducting magnets, each holding in its field a singularity, spun up around a central gravity at relativistic speeds, and positioned in the path of on comming planets so that they can be split in half and their energetic cores consumed for energy and materials.It stokes the fire of my science fiction love for all things VERY big. Ce roman est la suite de le grand vaisseau. Et si dans le premier tome le big dumb object était le vaisseau lui-même, il s'agit cette fois-ci d'une nébuleuse ... Et je ne vois pas comment on peut faire plus énorme comme objet bizarre.Il y a donc des trous noirs par milliers, des créatures encore plus étranges que dans les tomes précédents, des humains quasi-immortels aux pouvoirs quasi-divins, et tant d'autres choses superlatives.Je trouve étonnant que chacun des tomes de cette histoire arrive à m'étonner à ce point, alors que la nature hyperbolique de ces histoires devrait me lasser. Mais pourtant, non : je reste ébahi comme un gamin par le gigantisme des choses.Et j'en veux encore ! A very good hard sf space opera somewhat reminiscent of true modern classics of the genre, like Vernor Vinge's A Fire Upon the Deep. I enjoyed it greatly, especially for its truly gargantuan scope and inventiveness, it truly lives up to Clarke's law about sufficiently advanced technology. Made it to page 53. See previous updates. Better luck next time? DNF. Number 2 of the series. Set in the far, far future, on a huge planet-like ship filled with caverns and rivers, commandeered by humans millennia ago, and now home to a huge number of species, most of whom can extend their lifespan indefinitely. They have been flung off course during a recent civil war and they now find themselves entering the Ink Well, a dark nebula, filled with... well nobody knows. It’s a book about fear and the unknown; about the big questions that are so obvious we don’t think to ask them; about identity; about how loneliness and isolation shapes us. It’s a big book in all senses! It took me about three quarters of the book to get used to the way the story was told (lots of description and a sense of distance from the characters), but I’m glad I stuck with it. It is simultaneously deeply serious and utterly ridiculous. Honestly, I don't know why I like these books. This is very hard sci fi and to be honest I was fairly lost on many occasions with the somewhat detailed descriptions of stellar mechanics and such that was just too much for my blonde head. Its weird that it felt very technical and yet so many details felt glossed over to the point where I just kind of went with the flow and hoped that it all made sense later. Most of it did not. But the characters, as in the first book, are intriguing and the basic plot kept me wanting to know what happens next. It's hard to explain but I did not understand many of the details of what the heck was going on yet I still kept plowing through it to grab onto those interesting bits of character interactions and descriptions of the Great Ship and it's mysteries. It's like the scale of the story is incredibly fascinating even if I don't understand why. I suspect that is an indicator that Mr. Reed is a very good writer who knows how to hook a reader and tell a good story that keeps me wanting more. On to the next one. This book is the followup book to Reed's book "Marrow". I did not like this one any better than Marrow. It's pure fantasy, not science fiction. I did not really read all of the book. After about 30% of it on my Kindle I skimmed it the remainder of the way to the end, reading a paragraph or two or a chapter here and there. I was trying to see if anything peaked my interest enough to read it more closely. Then I read the last two chapters to see how the story ended. The ending, in my opinion, was just like the rest of the book, nebulous. The writer's style seemed to be to tell the reader a few things and then let you surmise or infer that something else happened.The things that I found unscientific or unexplained in the book were. First the ship was described as huge but it was not until this book when the writer gave a small clue of it's size by mentioned that it had the mass of 6 or 8 planet Earths. Then there was a very brief description of the bridge. But that brought to my mind, how did the people from Earth get into the ship in the first place? How did they learn to pilot it? How do you pilot a ship that is as big as 8 planet Earths from one place? Why would a great ship have continued problems with strikes by asteroids and comets? In most of the science fiction books I have read the ships are protected by shields or force fields. A detailed description of the ship, covering 3 or 4 chapters, should have been at the beginning of Marrow. How would people live on the outside of a ship as one group did?? How did they eat and eliminate waste outside the ship all of the time? Wouldn't they be subject to radiation from space?? While reading this book (books) I kept thinking about how much I enjoyed reading Rama, and even The Ringworld books, and Helix. All three were about people living in artificial worlds. They were all MUCH better then these two books. Next, the humans we soon learned were immortal; could even be reconstituted from a skull if they were killed. How was this done?? So what about the other "passengers" on the ship who were rarely mentioned. Were they all immortal also? Where did they come from and why would they want to be passengers on a ship going nowhere? All this just does not make sense.The writers style was difficult to read (as I said also about Marrow) because he seemed to dwell on people and circumstances and not take the story line forward to a conclusion. It was actually torture for me to try to read this book. In the end I concluded that the writing style resulting in the book being like a text book with so much information that you need a highlighter to underline stuff so you can go back and read it again to get the meaning and/or to put facts together. ‘The Great Ship is home to a multitude of alien races and a near-immortal crew. They have toured the Milky Way for millennia, the best and the brightest from a thousand worlds, but the true purpose of the ship has remained hidden. Now, time is running out. The huge spacecraft is heading for the dark, immense region of space known as The Ink Well, and the only entity in the universe more vast and mysterious than The Great Ship is lying in wait…’Blurb from the 2005 Orbit paperback editionReed is a stylist. Claiming to have no influences in the SF canon, the Nebraska-based author is very much an individual voice, although there are echoes of Simak in some of his early work.Since ‘Marrow’, sales of which elevated Reed’s profile to the level of best-selling SF author (rather than modestly selling quality SF writer), his books have moved away from mid-America based (yet complex) slow moving tales to a form of post-cyberpunk space opera.Here, in this sequel to ‘Marrow’, Reed once more employs one of his favourite devices, the near-immortal superhuman, or rather, an entire population of them, travelling through space on a ship the size of Jupiter which has a world entombed in its core.The Great Ship, as it is known, attracts the attention of the polyponds, separate parts of a gestalt Gaian entity which inhabits an entire nebula.Reed’s writing style is deeply poetic, stylistically romantic and oddly appropriate for the society he has created. Near-immortal humans on the Great Ship see little change and neither does their society. The almost baroque style seems therefore entirely apt.Reed is not an author prone to writing sequels, having only done it once before in his career to my knowledge, and one does have to ask how much the conception of ‘Well of Stars’ was influenced by the success of ‘Marrow’.I have noted previously a problem Reed occasionally has with ending his novels, and he seems to have left this open for a third voyage on the Great Ship.The ending provided here is somewhat unsatisfying and relies rather too much on a Deus Ex Machina provided by ancient aliens who have been living in hiding on the ship for thousands of years.Having said that, his work is generally superior to most other contemporary SF and this is a genuinely good novel, but one feels that he could have done better. Kind of slow and odd-paced. Ending was hurried and truncated like he ran out of ink. Good hard science fiction, though! I read Robert Reed mostly for his ideas and concepts, not because of his superior storytelling or character development. This sequel to Marrow didn't even have the novelty of introducing the Great Ship and Marrow itself, something both the novella and book used to keep the reader engaged. Here, high concept physics is flying all over the place, which though certainly inventive, doesn't serve as a hook to keep you turning the page (except to get through it faster). The characters are paper thin, and you don't really care what happens to any of them; I found myself caring more about the Great Ship. Nonetheless, any and all personal drama is swept aside to deal with the galaxy-crossing, eon-spanning confrontation between the enormous Great Ship and the even larger 'thing' that lives in the darker-than-dark Inkwell.The antagonists' motivations are unclear, or so simple that it's difficult to imagine all the time, energy, matter and effort that is wasted on such simple goals. The protagonists always have a solution or counterattack in the wings, so you never get a sense of them being in any real danger.Overall, it felt like a weak attempt to emulate the cosmos spanning stories of Stephen Baxter. Interesting one. I hadn't realised it was a sequel prior to page 1, and continued not o realise that for some time. So it can be read without having read Marrow first, although I'm sure it would improve if one did have the backstory. I also suspect there's a third to come, based on the ending.It scores points for really, really big objects in space; exploration and contact themes; and a fair number of interesting ideas and technologies. Like some other reviewers, I think the characters are a bit thin, especially the guy who actually makes first contact, so it loses points there. For me, there are some similarities to Banks's Culture novels and Greg Egan's Diaspora in terms of human evolution and enhancement, human/alien/AI interactions and reliances, and eon-spanning timeframes. It does stand up well as a something new and of itself though. I enjoyed it enough to go and seek out Marrow at some stage soon. From the beginning I was a bit lost with this book, most likely due to lacking read the first book Marrow by Robert Reed. The book itself once I finally forced my way through, was very well written and included an interesting concept of humanity and life that was refreshing. I will re-read the book later this year once I pick up it's predecessor, hopefully with the second read though I'll understand more behind the story-line and be able to grasp some of the underlying intents Robert included, as opposed to diving into the world where I had no idea anything of it's history. Not quite as successful as it's predecessor and I agree, the characterization loses out a little to the plot, but it is a good read, but suffers from an abrupt anti-climactic ending, which is clearly the path to a second sequel. Hopefully it will be the Vortex to the predecessor's Axis (a reference to Robert Charles Wilson's series of books - Spin, Axis and Vortex - the middle book being the weakest).Reed certainly seems to know his science and it is satisfying enough, it takes the foreground a little too much here.Reminded me (as did Marrow) of the wonderful 'Unto Leviathan' ('Ship of Fools in the US) by Richard Paul Russo. I'm really writing this because the every other review on Amazon states that this is disappointing, or loses its way half way through. I couldn't disagree more. 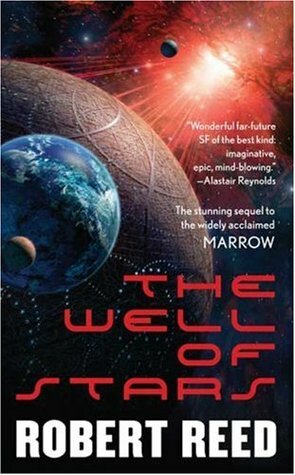 Where Marrow looks in, The Well of Stars looks out and delivers a constantly exciting, well written, technically involving and deeply sinister tale of... (well I don't believe in reading the back cover before the book so won't go any further). If you enjoyed Marrow, please please give this a go. I've read some cracking scifi in 2010 and this was probably the best. The writing is dense and easy to get lost in (which can be a good or bad thing, depending on your perspective). A handful of times I passed through an adjective so awkward it took me out of the book thinking "ugh, really? *That's* the best word he could think of here?" But I'm forever harping that modern fiction has lost sight of the importance of plot, and this book has quite the story arc, so it gets bonus points for remembering to tell a good tale. Ugh. I had high hopes for this book, but towards the half way mark it just got weirder and weirder. Then 100 pages from the end, it got downright confusing with conversations between entities that you were barely introduced to and can barely put into context. And then it just ends with this big turn of events barely explained. Very disappointing. I thought that the great ship as a place was fantastic. But the story didn't help me feel, smell or taste anything. For all the never ending explanation from the author, it just didn't draw me in. It kept me reading till I finished it but I never take this long to get through. Its not the story or the characters, its the writing. A good read, with lots of action and moments of philosophical insight which resonate with the reader. Lovers of Reed's Great Ship will enjoy this novel. My only complaint is that too many new loose threads appeared at the end of the novel, almost as if this was supposed to be the second book in a trilogy instead of a stand-alone novel. Good sequel. I hope there's another! I hate to give up on a book, though I found it rather plodding. Actually enjoyed this more than Marrow. Was interesting to see more of the universe outside the ship. Robert Reed - He has also been published as Robert Touzalin.